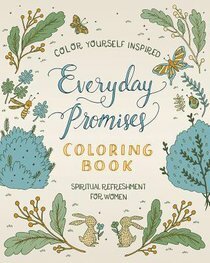 Color your way to an inspired faith with the brand-new Everyday Promises coloring book. Forty-six unique images on quality stock will comfort and inspire through beautiful design, prayers, and scriptural promises. The backs of each generous 8x10 coloring page are left blank-perfect for coloring with crayons, colored pencils, and markers. About "Spiritual Refreshment For Women (Adult Coloring Books Series)"